And how long before I decide whether to renew my season tickets? 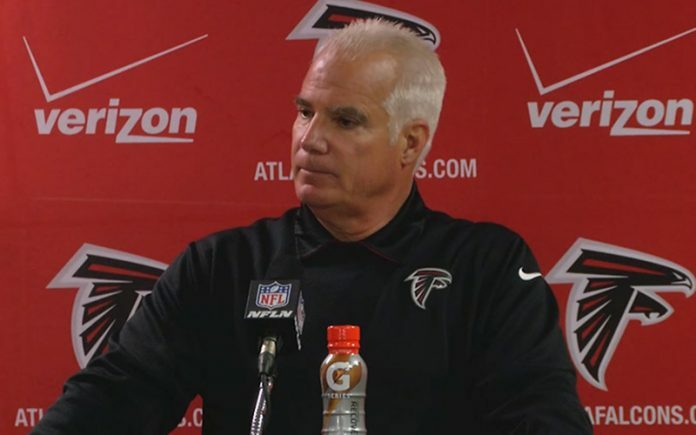 Today’s announcement that Falcons owner Arthur Blank had fired head coach Mike Smith surprised no one who saw yesterday’s shellacking by the Panthers, but it didn’t make it any less sad. I’ve been a season ticket holder for most of Smith’s tenure, and it’s impossible to overstate the transformative effect Smith had on the organization, which, as Blank reminded us at today’s press conference, had never had back-to-back winning seasons in franchise history until his arrival. Think about it: In the past seven years, we go into games expecting the Falcons to win, not lose. That’s huge. AJC columnist Jeff Schultz chastised Blank for hiring—before yesterday’s game—a search firm, Korn Ferry, to aid in the hunt for a new head coach. “Shame on Arthur Blank,” he wrote. Blank didn’t address Schultz by name, but denied the leak came from the Falcons’ organization. He defended the decision by saying it was his job, as owner, “to look around corners.” In any case, Schultz thought it was a “buzz kill” before the biggest game of the season. But it could also have been a motivator: If the team loved Smith as much as they say, what better incentive than to prove Blank wrong? Blank called the decision to fire Smith a “brutal” one and as difficult a decision as he’s had to make in his professional life. He mentioned twice that he and Smith ended their conversation this morning by expressing love for the other. But “in the cold light of day,” Blank said, he concluded that Smith wasn’t the guy to lead the Falcons “to the next level.” Blank is 72, and although he talks often about wanting a Super Bowl championship for the city and the state, it’s clear he also wants one for himself. What owner doesn’t? Blank built Home Depot into a retail leviathan, and it must be vexing that fielding a championship-worthy NFL team is so devilishly difficult. The prospect that the NFC championship two years ago may be the closest the Falcons will come to the Super Bowl for years to come is a thought he can’t abide. Speaking of which, nobody asked what impact, if any, two consecutive losing seasons will have on the Falcons’ personal seat license plan for the new stadium. An aggressive PSL plan is going to be necessary to offset some of the cost of Blank’s new stadium, already $200 million over the initial estimated cost of $1.2 billion. But in Atlanta, a city populated with residents with imported allegiances, how much can the team realistically expect to raise through PSL sales when the team it’s fielding is such a disappointment? The Falcons aren’t the Packers, or the Steelers, or the Eagles, where the reservoir of local support is bottomless and inexhaustible. I can’t help but imagine that with each loss this season, the Falcons organization was forced to adjust downward its projected revenues from PSL sales. In the next few weeks, I have to decide if I’m going to renew my own season tickets. I’m going to need some convincing. Anyone?